Here is a surprise revival of an old friend. One of my original freebies that have received plenty of downloads. I have converted this guy to valid XHTML, clean semantic code, with plenty of room for customization. This was initially designed for a client in the medical software field – which unfortunately didn’t work out. You can have this baby, complete with the updated Photoshop files for only five bucks. The homepage, though intended for a specific niche – can be applied in almost every type of website that is pitching some type of product. The large feature area exposes your slogan loud and clear, partnered with a nice product shot on the left. This looks good with or without the wavy curves in the background – which can be easily removed. The middle sections are containers that house almost every aspect of a professional company: testimonials, latest news from their company blog, a client list, about the company etc. 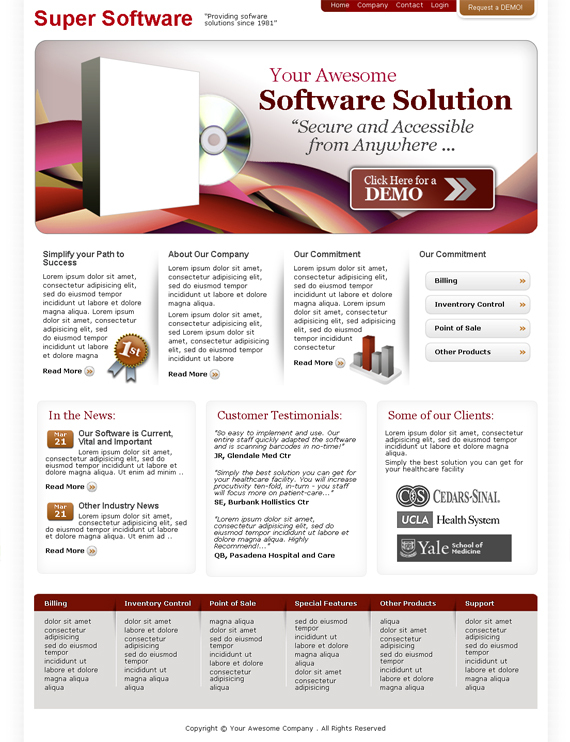 The footer section are six mini columns that contain lists of internal links – to provide easy access to more information about their product. Get ahead with what your client is thinking and present this design for their homepage. Simply slap on your brand and edit some text. I can almost see the delight in their faces. Some of these templates are excellent. The rotary template would be great for a photographer or designer. Put in a rotating carousel and that would look amazing. Also the “blue” template would be great for anything. Michael you have done well with these templates. And for 5 bucks they are a steal. Nice template! I Like it. Anyway, i want to know if this template has an admin area to manage the content?